Are you looking for something new to read? You always should be. 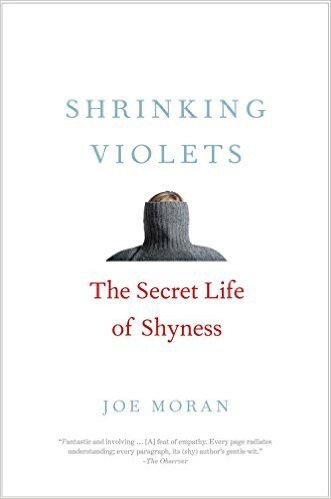 If I may, let me suggest Joe Moran’s Shrinking Violets: The Secret Life of Shyness, which is out now from Yale. I’m not sure how you feel about cultural history as a genre, but even if you are skeptical I am confident that this will be the exception to your (completely understandable) distaste for the field. Even as someone who more often than not enjoys works of this kind I am well aware of how tiresome they can get, so it is an absolute pleasure to read something that is so good at what it does that you finish wishing it were longer. Often seen simply as a wish to withdraw from the company of others, shyness can also amount to an undue interest in others, a desire for human connection that defeats itself through desire or uncertainty. For me, shyness has less to do with simple timidity or fear than a kind of social deafness, a tin ear for nonverbal cues, a sense that I have failed to grasp some invisible thread that holds communal life together. [S]hyness can be an implement of passive-aggressive willfulness and still be honestly arrived at. [The aristocrat Stephen] Tennant seems to have fallen for a common self-deception: he was unable to stop nurturing his unhappiness because he thought it made him who he was. [Nick Drake] barely mentioned to his sister that he was making his first album and then, one day in the summer of 1969, came into her bedroom, threw the record on her bed, and said, “There you are.” It was the classic, self-defeating act of the shy: investing in something that you hope will change people’s idea of you and then announcing it with a throwaway gesture that fails to convey how much it means to you. In our self-service, automated world, we forget that until half a century ago, shy people had the unavoidable daily ordeal of talking to service staff: shop assistants, floorwalkers, doormen, gas-pump attendants…. Nowadays the shy can scan their own items at the checkouts or, better still, fill their virtual shopping baskets online and click to buy; sliding doors and lifts have made doormen and porters almost extinct; and the latched-nozzle gas pump with automatic cutoff has turned all gas stations into lonely atolls of self-service. The sadness caused by shyness is real, and helping others to take the edge of that shyness is a noble aim. But taking a drug for social anxiety — for feeling stupid, boring or unlikeable — feels like shouting at the wind, arguing with the rain. It feels like trying to find a cure for being alive. The book is filled with these kinds of observations, but it never feels padded or meandering. As someone who is not of a totally gregarious nature I found myself nodding in recognition more often than I was comfortable with. But even if you are extroverted to the point of being exhausting to everyone around you there is plenty here that will make you pause for a moment to think, Yes, that’s true. Either way, if you’re sitting somewhere reading it you will probably be left alone, and what more could you ask for? I could not recommend it more highly.